China’s aquatic fauna and its vast marine areas are under threat from intensive coastal exploration and land-based pollution, a senior official said. Although great efforts have been made in the past few years, aquatic biodiversity is still decreasing and pollution in coastal areas is still increasing, Zhang Zhanhai, director of the department of international cooperation of the State Oceanic Administration said at a workshop organized by the Project on Biodiversity Management in the Coastal Area of China’s South Sea in Wenzhou on Sunday. The project, which began in 2005 and will finish in 2012, aims to protect biodiversity in Hainan, Guangdong, Fujian and Zhejiang provinces and the Guangxi Zhuang autonomous region by protecting the marine environment. Statistics from the State Oceanic Administration showed nearly 83 percent of the country’s coastline shares a fragile ecosystem, while coastal areas contribute to 70 percent of the country’s GDP. In 2010, China’s oceanic sector recorded an annual growth rate of more than 13 percent to reach more than 3.8 trillion yuan ($595 billion). 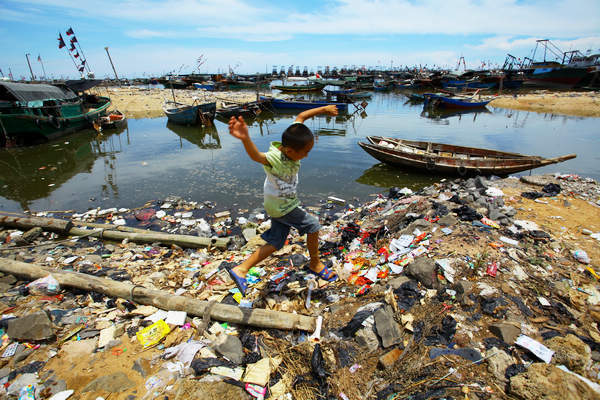 "China’s coasts and offshore waters are facing great challenges from recent widespread and rapid exploration and development, industrial waste water and sewage, and overfishing," Ma Chaode, project manager of the United National Development Program (UNDP), said at the workshop. The 2010 report on China’s marine environment released by the State Oceanic Administration echoed Ma’s opinion, saying increasing land-based pollutants and sudden marine incidents, such as oil spills, are threatening coastal and offshore areas. An oil spill that has lasted more than four months has polluted at least 5,500 square kilometers of Bohai Bay, with more than 700 barrels of oil leaking into the sea. The contaminated area is seven times the size of Singapore. Some marine experts warned it will take about 30 years for Bohai Bay to recover. China’s offshore environment is being damaged by excessive marine exploration and development, such as construction of ports and harbors. Since the 1990s, China has lost on average more than 20,000 hectares of wetland a year, decreasing the country’s natural ability to control floods and filter water, according to the 2011 China Ocean Development Report released by the China Institute for Marine Affairs. More than 20 sq km of the coastal areas near Huangjiabu in Zhejiang province have no marine life due to severe pollution, the report said. With development of the marine economy a part of the 12th Five-Year Plan (2011-2015), the country’s fragile marine environment and aquatic biodiversity will undoubtedly face greater challenges in the future. Feng Ji’nan, chief engineer of Guangdong’s Administration of Ocean and Fisheries, also expressed concerns over the new round of marine exploration and development. Methods for protecting aquatic animals are still being developed and will struggle to keep up the new problems in marine management that will definitely arise during the boom in the marine economy, Feng said. Some positive news might come from the proposed cooperation in protecting marine biodiversity and ecosystem between China, the UNDP and the Global Environment Facility. Ma told China Daily that the UNDP will invest $52 million in protecting China’s biodiversity and environment before 2015. Zhang Jianzhi, with the facility’s office under the Ministry of Environmental Protection, said sustainable development in marine resources will be the focus of the facility’s working plan in the next three years.